This is supposed to be an antijoke. 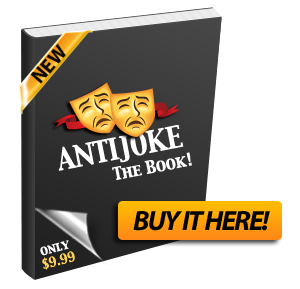 The antijoke would be 'A dyslexic man walks into a bar'. FFS. It doesn't matter whether it's funny or not - it is NOT an antijoke. An antijoke would be "A dyslexic man walks into a bar. His own feelings of inadequacy over his learning disability have driven him to drink and is driving a wedge between him and his family." This is NOT an anti-joke. This is a perfect example of a regular joke. They sometimes have problems with submitting comments. Its irony again people! That's not an anti-joke. It's a regular joke. Guys guess what? WHO CARES, ITS JUST A JOKE IF YOU DONT LIKE IT DISLIKE IT BUT DON'T TAKE IT SO SERIOUSLY!!!!! i actually cried when i read this!! oh god didnt mean to write it that way hahaha was trying to be funny! but u now know what i mean! This is not an anti-joke. Just a joke. Why was the little girl crying? Because she got raped by a giant scorpion. Here is not enough fire impulse in the world to get unspecified person through a custom dissertation. You have to lay money on total pressure of habit. This is the weakest attempt at an anti joke and yet its voted up 100+ times? Seriously people?!?! Ok so it's a joke, we get it but if you are offended you have the right tone. But don't be calling the creator names because of it. I have dyslexia and I thought it was funny buts it's really not that big of a deal :/ I also have ADHD and I go through people with that, such as on Facebook with status shuffle they have stupid and very offensive status's but yet people call them funny. Think of it, they aren't directly or purposely trying to hurt our feelings in anyway, but it may. But it could be worse. They could be directly saying "Dyslexic people are the most stupid people in the world" but they aren't so you should be happy for that. the anti-joke should have been, "A dyslexic man walks into a bar, and bought a beer as dyslexic people normally only have problems writing and reading not walking into a bar." It took me 20 seconds to figure it out. Dah! Why cant I stop laughing? A dyslexic man walks into a bra. His wife had hung up her clothes to dry, and the man wasn't looking where he was going. Admittedly, the man's dyslexia has very little relevance to this scenario. Who is the nutter talkin bout Hitler,Jews, Gassing,N*****s,Bombers,Dyslexic scum and Retards, Sounds like a cross between Alf Garnett and Victor Meldrew. And gets slapped in the face. What's worse than than getting hit by a car? Getting hit by a train. Haha, this JOKE is really funny. Guess what guys? Who cares! It was still funny, anti or not. Alright, dumbass with the first comment, dyslexia is when you mix up the order of the words, mix up letters, think some numbers are letters, and so on... Way to make a fool out of yourself. Guys calm down. It's just a joke. Give them a break; it was funny. Who cares if it's an 'anti-joke' or just a joke. This website is just to make you laugh. A dyslexic man walks into a bra, and bought a bear! Looks like the anti-joke went over people's heads. It is an anti-joke as long as he walks into an actual bra. It would not have been an anti-joke if bra wasn't a noun. It's a regular joke as long as you see it as a misspelling. A man walks into a bar. Dyslexia is not funny. Dyslexia has issues with transposition, whether its entire words, letters, numbers or while reading skips down the page. The joke is correct if the dyslexic person was writing the joke. Its irony people. hahaha i so happen to be to have dyslexia and it really has nothing to do with rearranging letters in words. but non the less this is a funny stereotypical joke on dyslexics as my self with make me fell warm and fuzzy! where was the heart of ocean found.